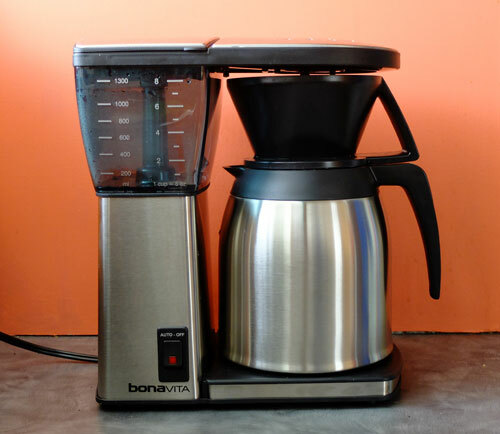 The Bonavita drip brewer, one of just a few brewers with SCAA certification. There are an awful lot of home coffee brewers out there. Whether you are walking the aisles of Walmart, visiting a specialty kitchen store or searching online, you’ll find a vast choice of brewers with a dizzying array of features. Perhaps the most confusing category of all is the good old drip brewer. Some are priced at under $30 dollars, while others cost hundreds of dollars. Unless your neighbor or best friend happens to be a true expert with coffee makers, it has been almost impossible to make a well-informed choice. Most confusing of all is the fact that many of the features offered with these brewers – like timers, hotplates, flashing lights etc – have nothing to do with brewing great coffee. In fact, there are just three factors to consider when choosing a good drip brewer. Does it heat the water to the exact right temperature? Does the water come into contact with all the coffee in the filter? Is the brewing time – the period of time when the water is in contact with the ground coffee – fall within the desired brewing time parameters to achieve the correct extraction? Get these factors right and you’ll have a drip brewer that can make coffee just as well as that guy with the big glasses at your local coffee store, bending over his press pot or Chemex brewer. There is a simple science to making good coffee, and a decent drip brewer can get it right. The trouble is, the factors that contribute to a great brew are rarely included in the information provided by the manufacturers of coffee makers. They tell you about the bells and whistles, or ask you to marvel at the low price, but don’t talk about the factors that actually matter. The SCAA is inviting manufacturers to submit their brewers for their next testing sessions, which will take place between August 26th and August 30th, 2013. In the meantime, they have awarded their certification to just four brewers so far. I congratulate the SCAA on introducing this program, simply because a major factor in holding back people’s appreciation of quality coffee has been the fact that in so many cases the quality of the beans is let down by brewers that simply aren’t up to the task.